Best Alabama Rig Fishing Rods? What about Alabama Rig fishing rods for this fishing lure that's taken bass fishing by storm throughout 2012. It's large and heavy and presents bass multiple (3-5) lures simultaneously. Because of this, it also presents the angler with tackle issues. "What about technique specific Alabama Rig fishing rods. Are there any?" you ask. Some will argue that the Alabama Rig is just a modification of an old, very well know saltwater tool called an Umbrella Rig. Certainly true, but the application is new to most freshwater anglers. What is an Alabama Rig? 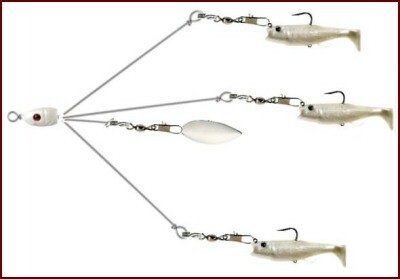 In the simplest of descriptions, the Alabama Rig, sometimes referred to as the “A-Rig”, is one that facilitates the bass- fisherman presenting an artificial school of baitfish to their prey. There are generally three versions. These are three, four or five wire set-ups. In general, the A-Rig has multiple wire arms extending from a central point, the head, with each arm and central post designed to mount separate lures. There is a straight, center wire arm extending from the molded lure head. Each additional arm (or wire) may be bent to varying angles. The end of each wire arm has a swivel attached to which is attached a lure. When properly assembled, the Alabama Rig resembles a school of baitfish and has proven to be a big bass attractor when used where there are suspending bass. The resemblance the rig has to a school of shad or other baitfish has placed the A-Rig in a class of lures that stands all by itself. Before this innovation, species such as bass, have always received lure presentations of single lures: top water lures, spinner-baits, crank-baits, swim baits, etc. For the first time in the freshwater angling world, multiple lure presentations are now available. Multiple lures uh? So what types of rods are suitable as Alabama Rig fishing rods? What about reels? What Types of Fishing Rod and Reel Combos and Fishing Line Are Best for an Alabama Rig? So what type of fishing rod is required to cast one of these new contraptions and how do you fish an A-Rig? For starters, you’re going to need heavier outfits as your Alabama Rig fishing rods. It’s not just the weight of the rig which alone can weigh upwards of 3/8 ounces without any baits attached. Add as many as five softbait lures and you will be pushing a total weight in excess of three ounces. This is as heavy as many west coast swimbait lures. So, if you’re accustomed to fishing a lighter rod, better hit the gym and bulk up those casting muscles, or better yet, just be sure your armed with a fishing rod designed for casting (and retrieving) this particular lure. A higher ratio reel for faster retrieves (like a 7:1:1) and be sure to select a reel that is nice and smooth so as not to tangle you’re individual baits in mid-air. Braided line is better designed to handle the intricacies of the Alabama Rig to include: casting, retrieval, hook set, as well as fighting and landing your fish. Braid has less stretch, is more durable, and overall more responsive to the conditions you will encounter when using this particular fishing lure. Additionally, using a heavier braided line will allow you to retrieve you’re A-Rig in the event that you get hung up because they are not cheap. The lure itself starts out in the $15-$25 range and go up in price depending on the price of the lures your place on your rig. So again, what type of rod will you need? Well, as with most things in bass fishing, it depends. It depends on the lures your throwing, the water you are covering, and the technique your using. Choose a fishing rod that is “right-sized” for you, too heavy and you’ll be miserable on the water and sore the next day, too light and you’ll never get the results you’re seeking in casting distance, accuracy, hook set leverage, control for fighting and landing the fish. Invest in the “right-sized, right-performance” fishing equipment and tackle. The fishing lure you're using costs upwards of $30 dollars, with braided line that will cost $30-40 dollars a spool. You're also using an expensive spinning or bait-casting reel costing maybe hundreds of dollars? So invest in the best performance fishing rod possible … and that will most likely be the fishing rod option that provides you the most confidence. This lure is new. The techniques are new to freshwater anglers. There is no “perfect” presentation. No perfect Alabama Rig fishing rod, yet. So find “what” works for you. Practice your style and become an expert at your technique. Grow confidence in your Alabama Rig and how you fish your rig. Begin fishing your new A-Rig on water you know routinely produces good “numbers of fish.” After a few successes, begin testing your presentation and honing your skill. Once you gain some comfort and confidence, you’ll be landing those “lunker” largemouth bass in no time! Also, be sure that your Alabama Rig fishing rod has hardware that can handle the meanest of braided fishing lines. We recommend American Tackle NanoPlasma or NanoLite guide rings on either casting or spinning guides. Why? Simply stated, the American Tackle hardware is second to none in as much the quad-leg design of their casting guides, the A-Frame design of their spinning guides, and the heavy duty design of their micro guides engineered to sustain incredible forces (both static and dynamic shock loads). Additionally, we recommend the American Tackle guides because they leverage a United States patent in their Ring-Lock design which is a double press of their guide rings into a solid fame rod guide (read as: that ring is never coming out). Be wary of the number of guides, the guide set-up, and the guide spacing on you’re A-Rig rod and pay attention to the guide ring material. Hardloy, alconite, and other light ceramics can groove under line tension while other inferior materials and ring design fail under dynamic loads created on this heavier tackle set-up. Know how your fishing rod is designed, balanced, and tuned because every detail counts when working your Alabama Rig. Some anglers use the Alabama Rig as their “search” bait much like a spinner-bait is used to seek out schooling or suspended fish in open water while other anglers prefer to aim their rig at precise targets. They will fan-cast to points, piles, humps, and other aquatic cover in a technique similar to that of using a crank-bait. Still, other anglers will cast shallow, varying depth with their rig to where they believe the fish are hunkered down. A common presentation technique for this innovative tackle design is to cast out, count the amount of time it takes to reach bottom, and then retrieve. If a fish doesn’t strike the baits, then subtract a second from your count on the next drop-down to depth and retrieve. Repeat until either you catch a fish or conclude that you have covered that particular column and area of water. This tactic works particularly well on deep drop-off points and submerged mounds or humps. Also, when fishing swim baits or jigs on your A-Rig, you can vary the weight of the jig heads to make it sink faster or slower. You can also vary your retrieve speed to either sustain or descend your school of baitfish in the water column. Ultimately, your presentation will depend on the where you believe the fish to be located and thus, how deep, shallow, slow, or fast you want to fish. It is important when rigging the Alabama rig to keep the baits as close together as possible without getting them tangled, unless of course you intend to “spread out” your particular presentation of schooling bait-fish or shad. Regardless of your intended use, your decision on what to use as your Alabama Rig fishing rods will be based on your personal experience because there is no “perfect” location to fish your Alabama Rig nor a tackle-specific set-up. There are just too many applications for the A-Rig to name them all and most likely there remain many to be discovered. Just remember, no one fishes the way you fish, where you fish, has your technique, style, or knows your specific angling requirements.